Norfolk Dumpling Cottage01263 715779work01603 870304fax Self-cateringNorfolk Dumpling Cottage is a newly converted, spacious property on Apple Blossom Farm near Horningtoft. The surroundings make this the ideal property for those looking for a peaceful holiday at any time of the year. • Access: Driveway for one large vehicle, further parking by arrangement. Access: Driveway for one large vehicle, further parking by arrangement. 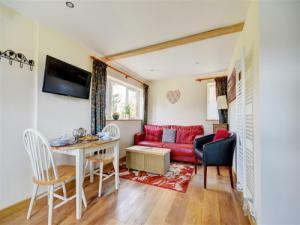 Norfolk Dumpling Cottage is a newly converted, spacious property on Apple Blossom Farm near Horningtoft. The surroundings make this the ideal property for those looking for a peaceful holiday at any time of the year.